Jonathan Mostow director of this year's "The Surrogates" starring Bruce Willis revealed to Collider that he has been in active development of the Universal property. He said, "Uh, well Sub-Mariner is sort of like all things Marvel, in a shroud of secrecy. So, it's a project that I've been developing and you know well have to see what happens." Mostow's comments aren't to revealing at all but he later spoke with Steve Weintraub off camera he revealed a bit more on the subject of Prince Namor. He told the news outlet that the main thing holding back "Sub-Mariner" is the right script. Weintraub's paraphrased Mostow's comments by saying, "He said the big hang-up is getting the script right and they haven’t cracked it yet. He said making a great super-hero movie is really tough and without the right script it’s impossible." I think all of the major studios have moved passed trying to just make a superhero movie for the sake of making one and Mostow's comments reflect that logic entirely. It is nice to think that studios are taking the time and nurturing these beloved characters and Sub-Mariner isn't the easiest of super heroes to put on film. There are quite a few obstacles in front of it. First and foremost the amount of CGI or underwater filming that will have to be utilized. Another big aspect to Namor is who will he fight and what will be the major conflict. 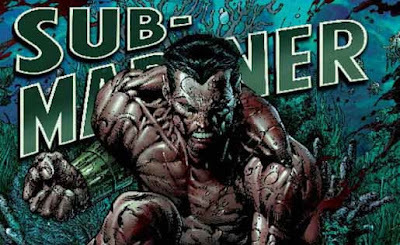 Sub-Mariner has always been a strong character in the Marvel team-up universe, but not as much in his own comic. Namor fought alongside Captain America in The Invaders. Namor is the person who later finds Captain America frozen in ice. Namor is part of the super hero council known as Illuminati along with Mister Fantastic, Iron Man, Doctor Strange, Professor X, and Black Bolt. The sad part there is, Sub-Mariner being owned by Universal means he will not be allowed to cross over into other Marvel hero worlds like the Fantastic Four or Captain America. Unless of course the Marvel and Universal came to some form of an rights-sharing agreement.